Sapporo is literally a hiking paradise. There are a seemingly unlimited number of trails, all at a 20 to 30 minute ride from the downtown area. The first trail (top third of the map) we tried is called the Maruyama trail (2.7 km), and is situated in Maruyama Park (Chuou Ward), along route 89. You can also take the subway and get off at Maruyama Kouen station. It took us one hour and fifteen minutes round trip, and we had a great view of Sapporo at the top which is 225 metres high. The trail is really easy, and has many stairs. It does get quite steep and rocky at times. The second trail (bottom two thirds of the map) we walked is part of a network of trails on mount Moiwa (Minami Ward), which totals 12.7 km. We started from the Kita no Sawa entrance, and it took us 30 minutes to get to a crossroad called Uma no Se (1.3 km). You can find that entrance in Kita no Sawa from route 82, at the end of a street called Miyama Doori. You can also get to that trail by bus getting off at the Kita no Sawa Kaikan Mae stop, but you’d have to walk quite a bit to get to it. We then proceeded to the top situated at an altitude of 531 m, by walking towards the Shimin Ski Jou entrance, which took us about 45 minutes (1.1 km). We found out with disappointment that there was a building with restaurants and a huge gift shop at the top. So much for hiking up a mountain! The view was even better than the previous trail, and we had lunch among a bunch of tourists who had come either by car or by bus. We then walked down the rest of that part of the trail, which took us just about an hour (2.5 km). We then walked another kilometre to route 230 where we took a taxi back to where we had left the car. The trail gets really steep and rocky at times, and has many stairs. The last part of the trail allowed us to see a beautiful view of the city among the mountains. In July 2006 my wife and I started hiking. I’ve hiked in Canada, the States and Europe when I was younger, but for my wife, who used to take the elevator to go up one floor, it was the beginning of a whole new experience. This category is dedicated to our new hobby, and I’ll try to give enough information for whoever might like to try hiking in Japan. The Miyagi Zao Eboshi ski resort is situated on Mount Zao, approximately one hour by car from Sendai, Miyagi. 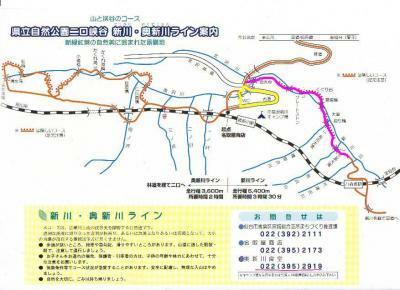 You can get there by taking route 286 towards Yamagata, and turning south (towards Shiroishi) on route 457. Right after crossing the bridge in Zao town, you make a right at the Miyagi Zao Kokeshi Kan and keep going straight. You can also get there by train getting off at the Shiroishi Zao station on the Tohoku Shinkansen line and taking a taxi. 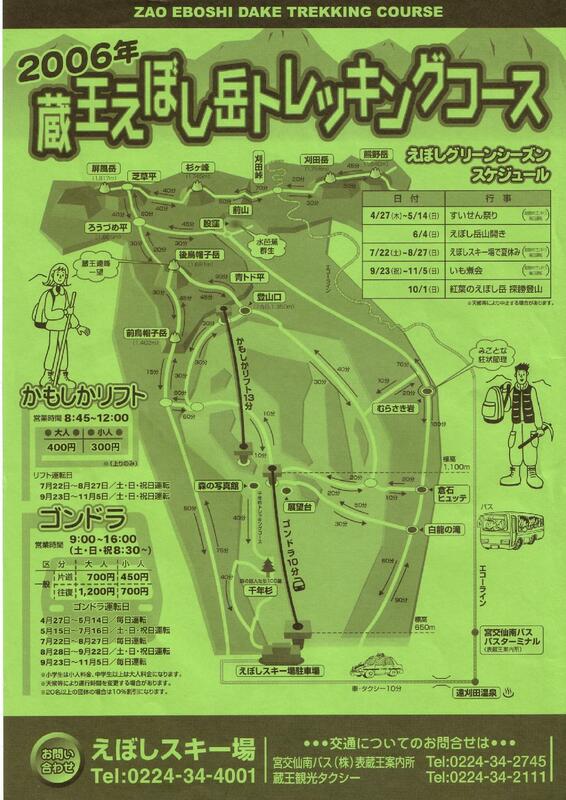 2006-07-27 (Thu): There are four trails at the Eboshi ski resort, each more difficult than the previous one. 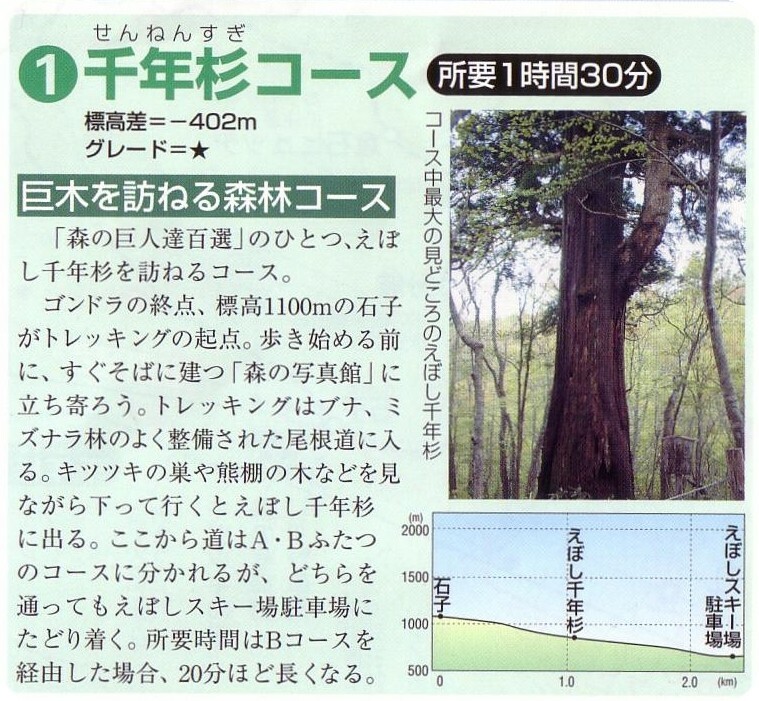 For our first mountain trail we picked the easiest one called Sennensugi, which literally means “The one thousand year old Japanese cedar“. The part of the trail we hiked is shown by the yellow line on the map above. The trail is really well marked with red strips tied to the trees and there are a few white signs with black arrows, but many of them are broken. The trail splits in two – trail A (beginners) and trail B (intermediate). Both trails converge again at the Japanese cedar from which the trail got its name. We (unknowingly) took the intermediate trail, which has many steep parts and two streams to cross by foot. It took us one hour to get to the cedar. The rest of the trail goes up smoothly, and there is another stream to cross. It took us 40 minutes to get to the top, and since we were pretty tired we took the cable car to come back down. The cable car runs until four o’clock and costs 700 yen. The trail is 5.4 km long and is situated in Sakunami (Sendai, Miyagi Prefecture) right behind Okunikkawa station on the Senzan Line. You can also get there by car by taking route 48 from Sendai towards Yamagata. The entrance to a dirt road leading to it is on the left handside after a small bridge called Aioi (in Roman letters) and right before the Sakunami Hot Springs, with a sign indicating Okunikkawa in Japanese, but it’s hard to spot. You can get a map of the trail at a restaurant called Okunikkawa Shokudou when you get there. 2006-07-22 (Sat): The yellow line shows the part of the trail we walked. It took us about two hours to make it (approximately 2 km – walking time only). There are two bridges to cross, many slippery stairs, and two narrow ledges. We came back using the regular road (loop on the right). 2006-07-26 (Wed): The pink line shows the part of the trail we walked on that day. We walked a distance of about 5 km round trip (2 hours 15 minutes to go, 1 hour 20 minutes to come back – walking time only). There are five bridges to cross, and the trail gets more difficult after the second bridge, from a landmark called “The Great Stone” . There are many slippery stairs and narrow ledges, a ladder, and even a stream to cross by foot. The trail is not very well marked, mainly with yellow and white paint on the rocks. It is confusing at times, and at one point the trail literally disappears due to the abundant vegetation. We were quite tired after a couple of hours, and instead of coming back as originally planned, we decided to walk all the way to the end of the trail where we hoped to catch a train to come back. However, we were lucky enough to find a man fishing who told us that that station was not in use, so the only way back was to take the way we came from. Worried that we wouldn’t make it before dark, we regained enough energy to make it back in much less time it took to go. Since April, we started exercising on a daily basis in order to lose extra weight gained during the winter, and to be healthier in general. I’ve been working out on and off for the past few years, but for my wife, who wouldn’t take the stairs to go up two floors, it was the first time in her life she exercised so much. Getting in shape has both physical and psychological advantages, and for the past month, we’ve even been walking downtown (a 50 minute walk) whenever we’d go out for a drink. Last week, my wife suddenly and quite unexpectedly expressed her desire to go climb Mount Fuji! Right, talk about self-confidence! Walking downtown and undertaking the 5 to 7 hour climb that Mount Fuji entails are two completely different things. So I made a deal with her: this year we’d go hiking first on local flat trails, then try steep trails, and if everything went well, we’d go climb Mount Fuji sometime next year. So last Saturday, we went to buy the basic hiking equipment (shoes, pants, windbreakers, backpacks, etc. ), and yesterday, we went for our first hike in Sakunami, a part of Sendai famous for its hot springs. That trail had been recommended to me by one of my co-workers, and we went there yesterday right after I got off work. The trail was indeed flat, but there were stairs to go down and see a waterfall, and according to the map, that path was reconnecting with the main trail after crossing 4 small bridges across the river. Although the main trail was indeed easy even for beginners, the path to the waterfall was another story. We had to take slippery stairs, step into the river’s muddy waters, walk on loose rocks, etc. I’ve done my share of hiking when I was younger, and for me it was a piece of cake. But for my wife, it was anything but easy. And to think that when I went to pick her up, she was ready to go wearing sneakers and white designer jeans! However, she kept going without complaining, and we eventually made it back to the main trail. It took us just about an hour to do that, and she was really happy she could make it. I figure she passed the test, and that we’re ready for more, as soon as the rainy season subsides. Hopefully this new hobby will take us to breathtaking views all around Japan. Edit (2006-07-24): Although there seems to be many hiking trails around Sendai and in Miyagi, information about them is either scarce and often incomplete. You have to speak to experienced hikers to find out about them, which is a bit frustrating. So I decided than whenever we’d go hiking I’d write more specific info and give maps whenever possible. The trail is 3.6 km long and is situated in Sakunami (Sendai, Miyagi Prefecture) right behind Okunikkawa station on the Senzan Line. You can also get there by car by taking route 48 from Sendai towards Yamagata. The entrance to a dirt road leading to it is on the left handside after a small bridge called Aioi (in Roman letters) and right before the Sakunami Hot Springs, with a sign indicating Okunikkawa in Japanese, but it’s hard to spot. You can get a map of the trail at a restaurant called Okunikkawa Shokudou when you get there. The yellow line shows the part of the trail we walked. It took us about an hour to make it (approximately 2 km). There are four bridges to cross, many slippery stairs, and we had to step directly into the river a few times.